The Lookout Records homepage considers Crimpshrine the "heart and soul of the East Bay, and the best band to come out of the Gilman/Lookout scene". 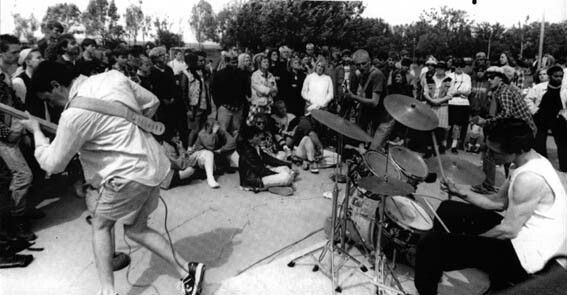 Musically, they played a somewhat slower yet melodic punk, and were a huge influence on the later East Bay scene bands, many of which can be found on Lookout Records. The main talent of Crimpshrine however seems to be their lyrics, which were always very well thought out, contemplating things like isolation, alientation and adiction. Although there were one or two personel changes, the core of the band was Aaron on drums, Jeff on guitar and vocals, and Paul on bass and vocals. The band members have since gone on to other bands, too many to mention at this point. Aaron has since made a name for himself though as the editor and writer of his fanzine Cometbus. This vinyl only LP has the distinction of being the very first ever Musical Tragedies release. Over the years, it has also become one of the most sought-after MT releases, with a mint copy going for hundreds of dollars. First 1000 had a yellow cover, another 500 had a blue cover. Includes a nice thick booklet with all the lyrics to the songs, some of them even translated into German. Hard to imagine, but at first Lookout Records actually turned this record down. Parts of it later did appear on Lookout though, on their Crimpshrine compilation "Duck Tape Soup".